06.04.2007 M.Notkin. Who’s Afraid Of The Queens Exchange? All the games that won the highest degree of approval from the experts had already been discussed in the Web. As usual it fell to my lot to go into the works of the "lighter entertainment" nature. Let's begin with a long and elegant combination carried out by the youngest GM in the world. 1.e4 e5 2.¤f3 ¤c6 3.Ґb5 a6 4.Ґa4 ¤f6 5.0-0 b5 6.Ґb3 Ґb7 7.¦e1 Ґc5 8.c3 0-0 9.d4 Ґb6 10.Ґe3 exd4. Smejkal playing against Spassky (Sochi 1973) had chosen a more solid continuation 10...d6 11.¤bd2 h6 12.dxe5 dxe5 13.Ґxb6 cxb6 14.Јe2 Јc7 15.¤h4 ¤e7 16.¦ad1 ¦ad8 17.¤f5 ¦d7 and managed to draw in the end. 11...¤a5?! Quite possible that after the game under consideration this idea will be shelved. 12.Ґg5 ¤xb3. Usually there occurred 12...h6 13.Ґh4 at first, but this is not the matter of principle as Black cannot do without exchanging the light-squared bishop and driving aside the dark-squared one anyway. 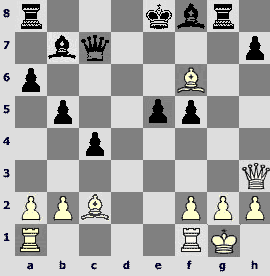 After 13...¤xb3 White would invariably reply 14.axb3 followed by 14...g5 15.¤xg5 ¤xe4. Here is a review of theoretical achievements in this area. 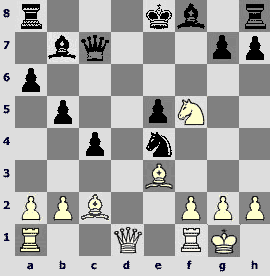 In Anand – Ivanchuk, Belgrade 1997 there occurred 16.¤xe4?! Јxh4 17.¤bc3 resulting in Black's taking over the initiative after 17...ўh8 18.¤c5 Ґc6 19.g3 ¦g8 20.¦e5 ¦g4 21.¤5e4 ¦ag8 22.f3. At this point instead of 22...¦4g6 Ivanchuk could have obtained the advantage with the help of an obvious sacrifice 22...¦xg3+! 23.hxg3 reinforced by not at all obvious intermediate move 23...d6!! (after 23...¦xg3+ 24.¤xg3 Ґxd4+ 25.ўg2 Ґxe5 26.¤ce2 or 24...Јxg3+ 25.ўf1 Ґxf3 26.¤e2 Ґg2+ 27.ўg1 Јxe5 28.ўxg2 White happily avoids all the dangers)24.¦f5 (after every other continuation Black also wins back the rook) 24...¦xg3+ 25.¤xg3 Јxg3+ 26.ўf1 Јh3+ followed by 27...Јxf5. Strongeris 16.¤f3. In Xu Yuhua– Stefanova, Hyderabad 2002 Black had chosen 6...¤g5, but after a couple of unhappy moves his bishops came to be only the passive contemplators of the opponent's developing initiative on the K-side – 17.Ґxg5 hxg5 18.¤c3 d6 19.d5 g4 20.¤d4 Јg5?! (20...Јh4) 21.¤e4 Јg6 22.¤g3 ¦ae8 23.¤df5 ўh8? 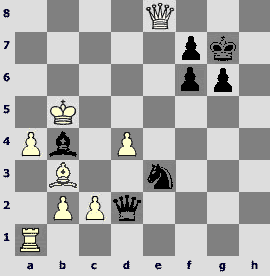 (23...Јg5) 24.Јd2 and White won. Igors Rausis would successfully defend this position for Black after16...Јe8 17.¤c3 f5. b) 18.d5 Јh5 19.¤xe4 fxe4 20.¦xe4 ¦ae8 21.¦xe8 ¦xe8 22.Јd3 Ґxd5 23.¤g5 Ґxf2+! 24.ўh1 Ґe4! 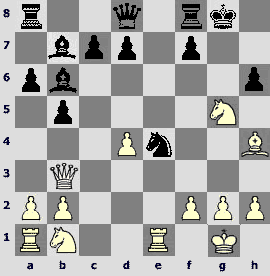 25.¤xe4 Ґxh4 Fedorov– Rausis, Abudhabi 2006. Repeating myself I can say again that all this is most likely only of a historical interest now. 13.Јxb3! h6. In case of 13...¦e8 (calculating on 14.e5? Ґxf3 15.gxf3 Ґxd4 16.f4 d6) 14.¤bd2! h6 15.Ґh4 g5 16.¤xg5 hxg5 17.Ґxg5 Ґxd4 18.Јg3 White's threats are irrefutable. 14.Ґh4 g5. Otherwise Black could hardly get rid of a pin along the h4-d8 diagonal without considerable losses, but now the idea of capturing with the queen becomes clear. 16.¦xe4! Ґxe4 17.Јg3 hxg5 18.Ґxg5. Were the white queen posted on g4 (which would happen in case of 13.axb3 and 17.Јg4) Black could have attacked it with his f-pawn, and now all he can do is surrender to the opponent's will. 18...Јe8 19.Ґf6+ Ґg6 20.¤c3. Defending himself from a mate and threatening with Јh4. 20...Јe6? The only way to prolong the resistance is 20...Ґxd4, although after 21.¤d5! (21.Ґxd4 Јe6 22.Јh4 f6) 21...Јe4 22.¤e7+ Јxe7 23.Ґxe7 ¦fe8 24.¦e1 Ґf6 25.Јf3! Ґxe7 26.¦xe7 there is no doubt whatsoever about the outcome of the game. 23.¤d5! Ґxd4. On 23...¦fe8 there follows a cool reply 24.h3. 24.Ґxd4 c5 25.¤f6+ ўg7 26.¤e8+ ўg8 27.Јh6! The mate is unavoidable, so Black resigned. In the following game Vladimir Akopian's success was also determined by his thorough opening preparation. 1.d4 d5 2.c4 c6 3.¤c3 ¤f6 4.e3 e6 5.¤f3 ¤bd7 6.Ґd3 dxc4 7.Ґxc4 b5 8.Ґd3 Ґb7 9.0-0 a6 10.e4 c5 11.d5 c4 12.Ґc2 Јc7 13.dxe6 fxe6 14.¤d4 ¤c5 15.Ґe3 e5. I won't go into fine points of the continuation 15...0-0-0 which is considered less reliable that the move made in the game; I'd like to mention only the curious fact that both players used to defend this position with Black. 16.¤f5. 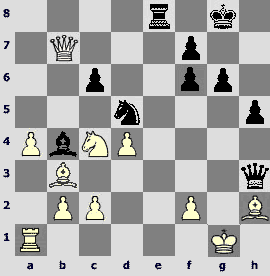 After the game Kasimdzhanov – Kasparov, Linares 2005 Black has no problem in the variation 16.¤f3 Ґe7 17.¤g5 0-0! 18.Јg4!? Anovelty. In Lautier – Kramnik, Monaco 1996 there occurred 18.a4 Јc6 (Black had successfully solved his opening problems in S Savchenko – Galkin, Azov 1996: 18...¤f6 19.axb5 axb5 20.¦xa8+ Ґxa8 21.Јe2 Ґb4 22.Ґf4 0-0 23.Ґxe5 Јc6 24.f4 ¦d8 25.ўh1, and the opponents agreed to a draw) 19.axb5 axb5 20.¦xa8+ Ґxa8 21.Јg4 g6 22.¤h6 ¤f6 23.Јg3 with complex play. The move 18.¦e1 has also been tested. After 18...g6 Hahn and Ippolito (Seattle 2003) agreed to a draw, and Graf and Berkes (Aghia Pelagia 2004) had played some more moves, but after 19.¤h6 Ґg7 20.Јb1 Јc6 21.f3 ¤c5 22.b4 ¤d3 23.Ґxd3 cxd3 24.Јxd3 e4 25.Јb3 Јc4 26.¦ad1 the outcome was the same. 18...¤f6 19.Јh3. Preventing the opponent's Q-side castling. 19...g6. Akopian's strengthening creates problems in the main line. I will try to enumerate the sensible (in my opinion) Black's attempts. It won't work to prepare for the K-side castling by way of 19...Ґd6, as after 20.¦ad1 ¦d8 21.Јg3 (still stronger is 21.Ґg5!) Black cannot play 21...0-0? because of 22.Ґb6. (Immediate 20.Јg3? 0-0 21.Ґb6 Јd7 22.¦ad1? is parried by 22...Ґe4!, and Black is a pawn up). The other relatively suitable for dark-squared bishop square is b4, but after19...Ґb4 20.a3 Ґa5 21.b4! 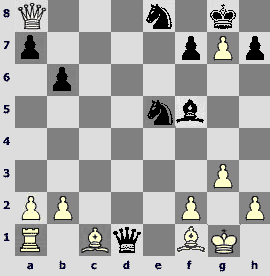 cxb3 22.Ґxb3 Black has to forget about castling, and his king is in for hard times. Dubiousis 19...e4 20.Ґd4. On 19...¦d8 there follows simple 20.¦ad1 with an unpleasant threat of Ґg5xf6 (less strong is 20.Ґg5 Ґc5). Perhaps the best decision is19...Ґc8 intending to remove the formidable knight, although after 20.Јg3 Black still has to take a lot of pains to achieve equality. 20.Ґg5! In case of 20.¤h6 Black consolidates by way of 20...Јd7 21.Јg3 Јe6 22.¦ad1 ¤h5. 20...gxf5. In comparison with the variation cited in the preceding remark after 20...¤e4 21.Ґxe4 Ґxe4 22.¤h6 Јd7 the e5-pawn weakness is noticeable, for example: 23.Јg3 Јd5 (23...Ґg7 24.¦fe1 Ґd5 25.¦xe5+) 24.¦fe1 Ґd6! (24...Ґg7 25.Јh4 Ґd3 26.Ґf6+-) 25.Јh3!? (threatening with ¦xe4! ; less clear is 25.¤g4 0-0 26.¤f6+ ¦xf6 27.Ґxf6 ¦e8) 25...Ґd3 26.¤g4 Јe6 (26...0-0 27.Ґf6 with an idea of 27...h5? 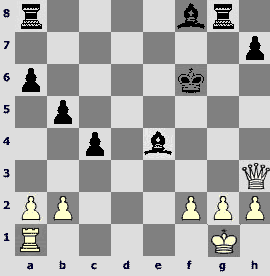 28.¤h6+ ўh7 29.Јd7+, and White mates) 27.¦ad1!? 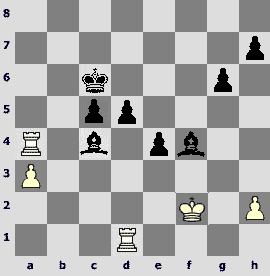 – Black has managed to hold on so far, but white initiative is highly unpleasant. The same can be said about the ramification 20...Јc6 21.¦ae1 ўf7 (21...gxf5 22.¦xe5+ with irrefutable attack) 22.f4! (this is stronger than 22.¦xe5 Јxg2+! 23.Јxg2 Ґxg2 24.ўxg2 gxf5) 22...e4 23.¤e3 ¦e8 24.f5 Ґg7 25.b3! 22.¦fe1! This move is a strictly necessary part of the white plan. To defend the g2-pawn means to lose: 22.f3? Јb6+ or 22.g3? Јc6. 22...Јc6? Losing forcedly, although White still has to show precision and fine play. Both 22...Ґxg2? 23.Јh5+ ¦g6 24.Ґxf5 and 22...Ґd6 23.f3 are bad. The most stubborn continuation is 22...¦xg2+ 23.ўf1 (23.Јxg2? Ґxg2 24.Ґxe5 Јc6-+). Now in case of 23...Ґd6 White has an advantage in "manpower" due to the fact that the а8-rook takes no part in the events. An approximate continuation is as follows: 24.Јxf5 (also good is 24.¦ad1!?) 24...¦xh2 (24...Јd7 25.Ґxe5 Јxf5 26.Ґxd6+ Ґe4 27.¦xe4+ with a win or 26...ўd7 27.Ґxf5+ ўxd6 28.¦ad1+ ўc5 29.¦d7 with a solid advantage in the ending) 25.¦ad1! (but not 25.Јe6+ ўf8 – there is a threat of Ґf3! – 26.Ґg5 and Black has a draw at the very least after 26...ўg7!) 25...¦h1+ 26.ўe2 Ґc8 27.Јe4! (this is more accurate than 27.¦xh1 Ґxf5 28.Ґxf5 ўf7!) 27...¦xe1+ (27...Ґb7 28.¦xh1 Ґxe4 29.Ґxe4+-) 28.ўxe1 Ґb7 29.Јf5 Ґb4+ 30.ўf1 Јf7 31.a3! with a win. There is still a resource 23...¦xf2+!, but after 24.ўxf2 Јb6+ 25.ўe2 Јxf6 26.Ґxf5 Јh6 27.Јxh6 Ґxh6 28.¦ad1 White's extra exchange is still a principal factor for the position estimate. 24.Ґe4! Less convincing (although sufficient as well) is 24.Јxh7+ ¦g7! 25.¦e7+! ўxf6 26.¦xg7 Ґxg7 27.Јxf5+ ўe7 28.¦e1+ ўd8 29.Ґe4. 24...Јxf6. After 24...fxe4 the g2-square is not under a threat any more and White's hands are free – 25.Јxh7+ with elegant ramifications 25...ўxf6 26.¦f5+ ўe6 27.Јf7+ ўd6 28.¦d1+, or 25...¦g7 26.Ґxg7 Ґxg7 27.¦f5+, or 25...Ґg7 26.Јh5+! ўxf6 (26...ўf8 27.Ґe7#) 27.Јf5#. 24...Јxe4 25.¦xe4 Ґxe4 26.f3 does not save Black. 27.Јh4+! Taking advantage of black pieces' being dispersed in conclusion. 27...ўf5 28.Јxh7+ ¦g6 29.¦e1! ¦d8. Or 29...Ґxg2 30.Јf7+ ўg5 (30...¦f6 31.Јh5+) 31.ўxg2. 30.Јh5+ ¦g5. In case of 30...ўf6 31.¦xe4 the d1-square is under queen's control. The followed game was commented by IM Andrei Deviatkin for ChessToday. Here is a kind of back translation. 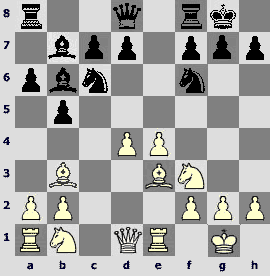 This game is typical for Malakhov, whose real play begins when the strongest pieces are gone from the board. He has already created a lot of masterpieces in the endings. 1.e4 c5 2.¤f3 g6. This variation is played by Malakhov from his very childhood. 3.d4 Ґg7 4.dxc5. It is considered that the strongest move in this position is 4.d5. 4...Јa5+ 5.c3 Јxc5 6.¤a3 ¤f6 7.¤b5. This position looks dangerous for Black as he has not managed to finish his development yet. 7...b6! Of course, Black cannot take the pawn: 7...¤xe4? 8.Ґe3 Јc6 9.¤fd4! (or simply 9.¤xa7) 9...Ґxd4 10.Јxd4 ¤f6 11.¤xa7 with great white advantage. 8.e5. 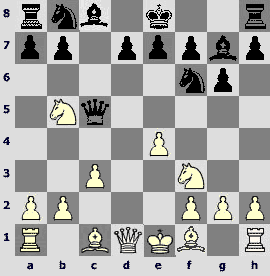 The idea of 7...b6 becomes clear in case of 8.Ґe3 Јc6 9.¤fd4 Јb7!, and black queen feels safe. 8...¤g4 [8...¤d5? 9.Јxd5] 9.Јd4 ¤xe5. Forced, as 9...Јxd4 10.cxd4 is bad from the positional point of view. 10.Јxc5!? The only game where this position had occurred continued like this: 10.¤xe5 Јxe5+ 11.Јxe5 Ґxe5 12.f4 a6 13.fxe5 axb5 14.Ґxb5 ¤c6 15.Ґf4 Ґa6, and in this roughly level position the draw was agreed, Robatsch – Bilek, Havana 1965. 10...¤xf3+ 11.gxf3 bxc5 12.¤c7+ ўd8 13.¤xa8 Ґb7. The fact that White has an extra rook is of no importance, as Black will get more than adequate compensation for an exchange soon. 14.Ґe2. On 14.Ґf4 Black will reply with accurate 14...d6! (but not 14...e5? 15.Ґe3 d6 16.0-0-0). 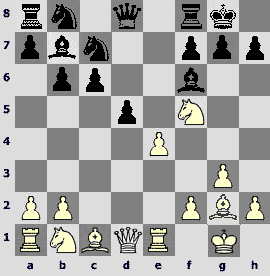 A few days after this issue of ChessToday had been published GM Dorian Rogozenko in his letter informed that a real novelty was only the 14th White move, and all the preceding ones had been already made in the game Alavkin – Kanep, Aeroflot Open 2004, commented by Dorian for Chess ҐaseMagazine. In that game there occurred 14.Ґg2 Ґxa8 15.0-0 d6 16.Ґe3 ¤d7 17.f4 Ґxg2 18.ўxg2 ўc7 19.¦ac1 ¦b8, and here White should have played 20.b4 keeping the dynamic equality. – M.N. 14...Ґxa8 15.Ґe3 d6 16.0-0. Rogozenko in his remarks suggests 16.0-0-0 ¤d7 17.¦hg1 ўc7 18.¦g4 Ґc6 with equality. – M.N. 16...a5. Another important move, preventing b2-b4. 17.¦ab1 ¤c6 18.f4. On 18.a3 with an idea to play b2-b4 without losing a tempo Black has a fine answer 18...a4 (hasty is 18...¤e5? 19.b4 axb4 20.axb4 cxb4 21.f4) 19.f4 (19.Ґb5 ¤e5) 19...¤a5! 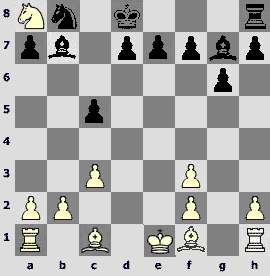 20.Ґb5 Ґc6 21.Ґxc6 ¤xc6 22.b4 axb3 23.¦xb3 ўc7, and it is clear that only White can stand worse here, as all his pawns are weak. 20...¤d8! Preparing the advance a5-a4, that has been bad before in view of Ґd1. Now Black intends to defend the a4-pawn by way of Ґc6 and to transfer the knight on a very fine e6-square. 21.b4 [21.f3 a4] 21...Ґe4 22.¦b2 ¤e6. White has managed to carry out b2-b4, but still the position remains closed! 23.f3 Ґf5 24.Ґc4 Ґh6 25.¦e2 ўc6 26.b5+?! Now it is quite an easy play for Black. Shaposhnikov has most likely just plain forgotten that Black can take the pawn with rook. 26...¦xb5! 27.Ґxb5+ ўxb5 28.c4+ ўc6 29.¦b2 ¤xf4 30.Ґxf4 Ґxf4 31.¦e1 e5. White rooks stand idle while black bishops control the whole board. 32.¦d1. If 32.¦b5 Ґd3 33.¦xa5, then 33...Ґxc4! (But not the greedy 33...Ґd2? 34.¦d1 Ґxa5 35.¦xd3), and White's problems do not tend to disappear. 32...Ґe6 33.¦b5 [33.¦c2 a4!] 33...Ґxc4 34.¦xa5 f5 35.ўf2 e4 36.fxe4 fxe4 37.¦a4 d5. 38.¦b1. Of no help is 38.¦xc4 dxc4 39.¦a1 c3 40.¦a2 ўb5 41.a4+ (41.ўe2 ўc4 42.ўd1 ўb3 43.¦c2 Ґd2) 41...ўb4 42.a5 ўb3 43.a6 Ґb8 44.a7 Ґxa7 45.¦xa7 c2-+. 38...Ґd3. White resigned, as black pawns cannot be stopped. And for afters there are two light, bravura black attacks. 1.d4 ¤f6 2.¤f3 e6 3.c4 b6 4.g3 Ґb7 5.Ґg2 Ґe7 6.0-0 0-0 7.d5 exd5 8.¤h4 c6 9.cxd5 ¤xd5 10.¤f5 ¤c7 11.e4 d5 12.¦e1. 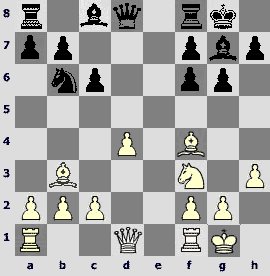 Chessboards of the world have seen a lot of glorious battles after 12.¤c3. 12...Ґf6. 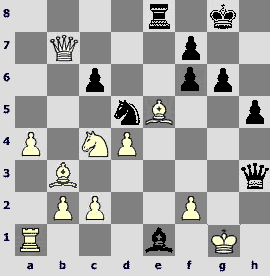 In the variation 12...dxe4 13.¤c3 Mamedyarov blasted Jakovenko in the latest European Club Cup in Fuegen game. 13.e5 Ґc8. The alternative is13...Ґe7 14.Јg4 g6. 14.exf6 Ґxf5 15.fxg7 ¦e8 16.¦xe8+. After 16.¤c3 ¦xe1+ 17.Јxe1 ¤d7 18.h4 Јf6 19.Ґg5 Јxg7 White has failed to get any compensation for a pawn in Tregubov – Gelman, Czestochova 1992. 16...¤xe8. Previously occurred only 16...Јxe8 17.¤c3. 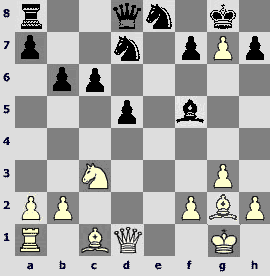 In Tregubov – Gorbatov, St. Petersburg 1996 after 17...¤d7 18.Ґf4 Black had made a tactical mistake – 18...¤e6? 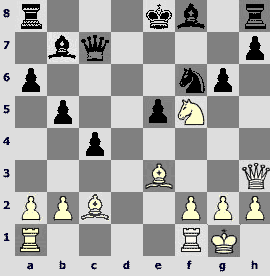 (he should have continued 18...¦c8), which White did not fail to profit by – 19.¤xd5! ¤xf4 (19...cxd5 20.Јxd5) 20.¤xf4 with obvious advantage. Getting ahead of myself I'd like to say that if Pashikian knew this game, it didn't do him any good. To a complex position leads 17...¤ba6 18.g4 Ґd7 19.Ґf4 (computer recommends "activating" the bishop by way of 19.Ґh6 Јe5 20.g5) 19...¤e6 20.Ґg3 ¤xg7, Doettling – J. Shahade, Boston 2001. 18.¤xd5? Oh yes, White will deliver his desired double blow against the a8-rook and f5-bishop, but in this particular situation he should have played 18.b4 with following Ґb2 и b4-b5. 18...cxd5 19.Јxd5 ¤e5! An elegant refutation. 20.Јxa8. Losing outright is 20.Јxe5? Јd1+ 21.Ґf1 Ґd3 (but not 21...Ґh3 22.Јe2). 21...Ґd7! If White still had some hopes that all this has been started in search of a draw after 21...¤f3+ 22.ўg2 ¤h4+ 23.ўg1 (23.gxh4? Јg4+ 24.ўh1 Ґe4+), then he is mistaken. 22.Ґf4. The principal threat is 22...Ґc6, the collateral one - 22...Ґb5. The variations are short but convincing: 22.b3 Ґc6 23.Ґb2 Јd5, or 22.Јb8 Ґb5, or 22.Јd8 ¤f3+ 23.ўg2 Ґh3+!, or 22.Јe4 ¤f3+ 23.ўg2 Ґh3+! 24.ўxh3 Јxf1+ 25.ўg4 ¤f6+. 22...¤f3+. Of course, not 22...Јxa1? 23.Ґxe5 Ґb5 24.Јg2. 23.ўg2 ¤e1+ 24.ўg1 Јxa1 25.Јe4. 25.Јd5 ¤f6 26.Јa8+ ўxg7 27.Ґe5 Јd1 makes no difference. 25...Јd1. Here too, by analogy with the preceding variation, 25...¤f6 looks quite fine, but the queen move brings the effective finale still closer. 26.Ґe2 ¤f3+ 27.ўg2 Јg1+ 28.ўxf3. 28...Ґc6! The queen is parted from its king, White resigned. We used to play for the Moscow Palace of Pioneers team together with the winner of the following game. It was nice to see Sergey in such fighting spirits. 1.e4 c6 2.d4 g6 3.¤c3 d5 4.¤f3 Ґg7 5.h3 dxe4. The continuation 5...¤f6 6.e5 ¤e4 7.¤xe4 dxe4 8.¤g5 occurred in one of the decisive games of Aeroflot Open 2007 Alekseev – Novikov. According to Evgeny Alekseev this set-up is highly dubious for Black. 6.¤xe4 ¤f6 7.¤xf6+ exf6 8.Ґc4 0-0. Sometimes 8...Јe7+ is included in order to transpose the play into endgame. 9.0-0 ¤d7 10.Ґf4 ¤b6 11.Ґb3. 11...a5. In Bronstein – Gurgenidze, Kislovodsk 1968 there was tested 11...¤d5 12.Ґg3 b5 13.Јd2 a5 14.a4 b4 15.c4 bxc3 16.bxc3 Ґe6 17.c4 ¤b4 18.¦ad1 ¦a7. 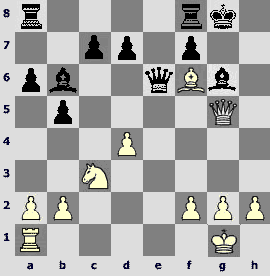 White had employed a promising pawn sacrifice 19.d5 ¦d7 20.¤d4! 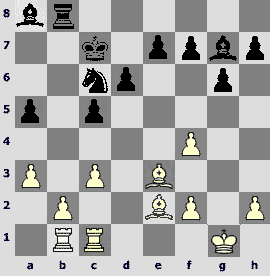 cxd5 21.c5, but after 21...Јa8 22.¦fe1 ¦e8 23.¦c1 ¤c6 agreed to a draw somehow. The game Vysochin – Sergienko, Voronezh 2006 developed in a more quiet manner – 11...Ґf5 12.¦e1 Јd7 13.Јd2 a5 14.a4 ¤d5 15.Ґg3 ¦fd8 (15...¦fe8 16.¦xe8+ Јxe8 17.c4 ¤b4 18.Ґc7) 16.¦e2 Ґf8 17.¦ae1 Ґb4 18.c3 Ґf8. As a result of the long struggle White has managed to win, but Sergey is apparently ready to amend his further play. 12.a4 ¤d5 13.Ґh2. 13.Ґg3 looks more natural for all that. 13...Ґf5 14.¦e1 Јd7 15.¤d2. 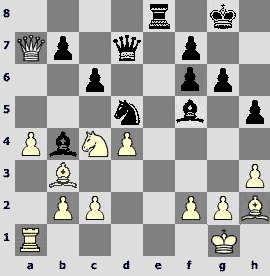 15.Јd2 leads to the game Vysochin – Sergienko with the bishop on h2 instead of g3. White aims his knight on d6. 15...¦fe8 16.¦xe8+. Worth attention is16.Јf3 with an idea of ¤e4. 16...¦xe8 17.¤c4 Ґf8! Indirectly defending his а5-pawn – after 18.¤xa5 Ґb4 19.¤c4 ¦e1+ 20.Јxe1 Ґxe1 21.¦xe1 there is a rough material and positional equality on the board. 18.Јd2 h5!? Everything could have been defended by way of 18...b6, but Black, having sensed the opponent's unhealthy intentions, does not try to prevent its implementation. 19.Јxa5 Ґb4. The queen's rush to the edge of the board in chase of a petty pawn is not commendable, and the more so because Black could have got fine compensation by way of 19...¦e2!? But Sergey prefers to drive the glutton still deeper in. 20...Ґxh3! curious draw could have been achieved in case of 20...¤e7 21.¦f1 ¤c8 22.Јb8 ¤d6 23.Јa7 ¤c8. Still White would have to play for it. And now the slightest careless motion leads to a collapse. 21.gxh3 Јxh3 22.Јxb7? It was necessary to play 22.¤e5 fxe5 23.Јxb7, and computers see only a perpetual check after 23...Јg4+. 31...Јe2+ (after 31...Јxd4 32.¦h1 Јc5+ 33.ўa6 Јd6+ 34.ўb7! 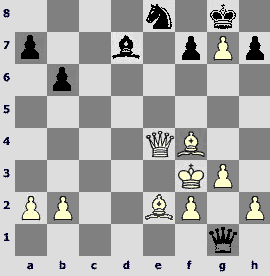 the only way for Black to escape being mated is to exchange the queens) 32.c4 Јd2 33.¦h1 Ґf8 34.ўa6 (hasty 34.c5? gives Black a perpetual check by way of 34...Јe2+ 35.ўc6 Јa6+ 36.ўc7 Јa7+ 37.ўc6, and it is White already who has to be extremely careful in choosing his moves) 34...Јxd4 35.c5 Јd3+ 36.Јb5, and White has an edge. 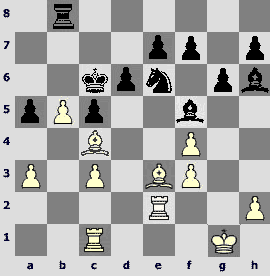 After 22...¦e4 23.¤e3 ¦xe3 24.Ґxd5 cxd5 25.Јxd5 ¦f3 Black can also count on a draw at best. A splendid bishop move settles the dust. 23.Ґe5. Neither 23.¤e3 Ґxf2+ 24.ўxf2 Јxe3+ 25.ўf1 Јf3+ 26.ўg1 ¦e4 nor 23.¤e5 Ґxf2+ 24.ўxf2 (24.ўh1 ¦xe5) 24...Јxh2+ 25.ўf1 Јf4+ can stop black attack. The only way to prolong the resistance is 23.Јb8 ¦xb8 24.Ґxb8 Ґb4, but even so Black has in reserve a powerful offensive of the K-side pawns. 24.Ґxf4 Јg4+ 25.Ґg3. Or 25.ўh1 Јf3+ 26.ўh2 Јxf2+ 27.ўh3 Јf1+ 28.ўh2 ¦e2#. 25...Ґxf2+! 26.ўf1. After 26.ўxf2 ¦e2+ 27.ўf1 Јf3+ Black mates being three pieces down. 26...Јe2+ 27.ўg2 Ґxg3+ 28.ўxg3 Јg4+. 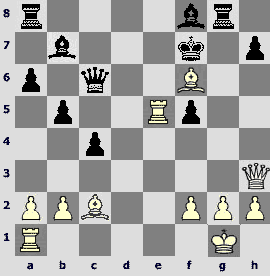 Black resigned in view of 29.ўf2 ¦e2+ 30.ўf1 Јg2#.